The rally of people and movements contra the new President has been incredibly heartening. From the Women’s March, to the 100daysofresistance, we are seeing a powerful civic backlash that America has not witnessed for decades. For years people have conjured up Orwell’s 1984 and Animal Farm references when talking about the state and leaders that seem have little imagination when it comes to their tactics. In keeping with that theme of stranger than fiction, one very interesting part of the recent protests is the art and posters that we’re seeing are drawing heavily from literature that foretells eerily similar worlds. 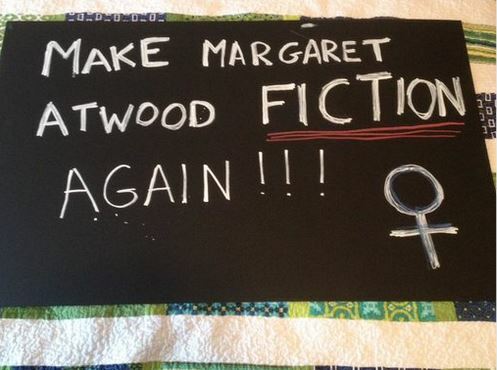 At The Woman’s March on Washington there were hundreds of signs that nodded to Margaret Atwood’s The Handmaiden’s Tale, the amazing feminist take on dystopia. In a recent post on utopiaordystopia.com, Rick Searle looks at Jack London’s The Iron Heal. Of particular interest to agrarians, this novel is set in state run by an Oligarch that has rested power from the Socialist and American farmer movement. How should we read these works? Cautionary Tales? Activist playbooks? Instruction manuals for dictators? Maybe we need to look at pursuing legal action against the new President for plagiarism? You can check out Searl’s full article here. You can check out more Atwood inspired protest posters here and here.